Did anyone get out yesterday (Monday)? My weather resources were predicting calm conditions, but the wind graph for Monday looks amazing. Would the difference between prediction and reality be a storm-related anomaly, or should I be ignoring the predictions more often? I'm curious if anyone has a collection of model predictions and actual outcomes, so that I can measure the reliability of the model under different conditions. Ikitesurf plus day of forecast nailed it. The first was fetched at 11:50am, though it's showing the 6am forecast for some reason (note that it shows more hours of data than the others, too, so I'm not sure what the deal is there). The second was fetched at 2pm. In between those hours, there was a major change. (The forecast appears to be updated more than once per hour.) At 4pm, as the wind was blowing earlier and harder than predicted, the forecast was pushed out another hour and eased up a bit. This trend of continually showing a positive forecast a couple hours from now continued for the rest of the night, as you can see again in the 6pm forecast. I noticed this drifting pattern last year, so I think it's a consistent problem with the model. So the morning/noon forecast was worthless, and that's a major problem because that's when I usually check it. And even as it was blowing, the forecast was predicting like a carrot on a stick: just wait two more hours. How am I supposed to use this? Should I be interpreting the wind speed as a minimum instead of an expected/average speed? Should I treat any wind in the forecast as a sign to show up at 2pm and wait? Should I be looking at something other than the wind speed? I really want to get this right this year. I've only been catching about 4 wind days a year at Jetty :/. Some days ikitesurf plus gets it right from morning, many days not. I use it as ONE data point when making decision. There are many data points available for free but you have to know how to interpret them. If you don't want to do that or can't for whatever reason like too busy, then paying for ikitesurf is your best option for convenience. The most important data points I look at are PA to SEA pressure and temp differentials. You can check during day how its developing by looking at Hat Island wind sensor, which gives approx current Jetty wind, Livingston Bay wind sensor and Padilla Bay wind sensor give preview of what may happen at Jetty about one hour later. You can look at what's happening in Straights and Admiralty. 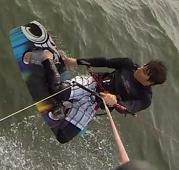 Talk to other kiters at Jetty and ask how they make the call. Look for chatter on Facebook Northwest kiteboarders day of and here on PSKite, understanding that day of OSR is easier on mobile phone using Facebook Northwest kiteboarders. Thanks for the tips. Can you help calibrate us? What's a good, medium, poor PA to SEA pressure or temp differential in your experience (ignoring the obvious cases of pressure/temperature gradients going the wrong way)? Or what combinations of those two should we be looking for? I'm assuming that you're talking about observed pressure and temperature gradients, and not forecasted ones. How far out in time does this particular pressure or temperature gradient help you predict? There is no hard rule, but what I look for is pressure difference NW .03 or higher with temp difference 8 degrees or higher so somewhere in that zone. Again, you can good Jetty wind with less than those parameters. Take a day you know it was windy and look at the data on what happened. Take a day, like yesterday that was forecasted to be windy, but did not turn out great, take a look at the data. You start to see patterns. As I write this at just before noon, the parameters are NW.03 and +5 (meaning Seattle is 5 degrees warmer than Port Angeles) and the wind on Hat Island sensor is NW 5 g 8. Needs a higher temp difference to get thermal rolling. At noon there will be another update and you can see the trend. Is it increasing, steady or decreasing? It could happen later today Sunday, or do a head fake like yesterday and only turn on for a brief period and not that strong. Early season makes it harder to predict compared to summer, when Jetty fan turns on more reliably under the parameters mentioned above. This is one tool to use along with the others (iKitesurf, NOAA, TJ, Gspot). Great info Pat. Thank you for taking the time to 'school' us on how to read for Jetty Island. Thanks! Here are a couple more tools. A new Jetty Island wind sensor is being installed. This is a pre-announcement of the new sensor. It needs a new anemometer and to be calibrated, tweaked for accuracy. It's not accurate at the moment, but can be seen here. Not sure how accurate or helpful this weather site for Jetty Island is, but might be worth bookmarking for future reference. I've found using the tools improves your chances of scoring a good session even though there are days that will defy forecast tools either way. Can't wait for the Jetty wind sensor to be fully functional! Where is the sensor located on the island?? Sensor is located on east side of island on top of shack adjacent to dock.